Ok how about we start with the good??? Well I just LOVE my Rachael Ray magazine even thought 1/2 the time I wouldn’t cook a thing in it because of the crazy ingredients but this time I hit a winner……….. In a large, heavy pot, heat the EVOO, 2 turns of the pan, over medium-high heat until smoking. Add the beef and cook, stirring to break up, until browned, about 8 minutes. Stir in the onion, garlic, zucchini, bell pepper and chiles; season with salt and pepper. Stir in the corn kernels, chili powder and paprika. 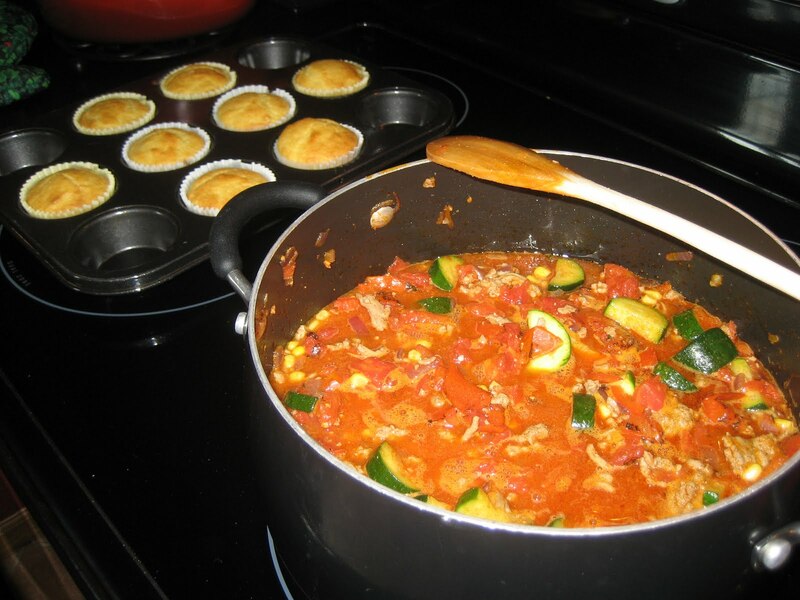 Cook until the veggies are softened, 6 to 7 minutes. Stir in the beer and cook until reduced slightly, 2 minutes. Stir in the tomatoes, thyme and lime peel and cook until slightly reduced, 5 minutes. Turn off the heat, then stir in the lime juice. 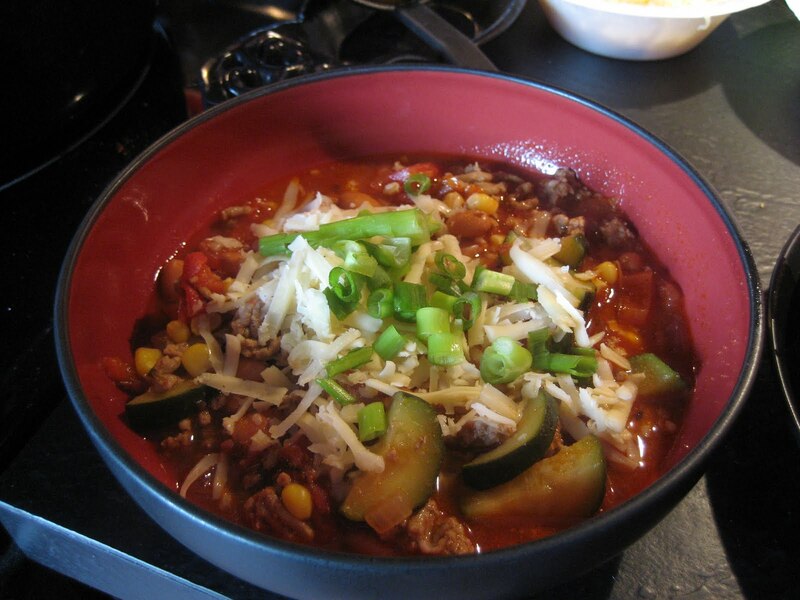 To serve, top the chili with the scallions and cheese. It was so yummy and other than the “prep” work was super easy to make! I served mine with corn bread and then had the leftovers for lunch again today and it was even better!! * Fire roasted tomato’s are on the grocery isle with the other canned tomato’s, it took me a bit but I did find it! * ps.. don’t peel your zucchini either! Ok want to hear about my Mess????? So last night I wanted to make the new Melissa D’Arbian Salmon cakes with Orzo from the Food Network , it looked soo yummy!!! So I added in all the “wet” ingredients into my bowl, my Orzo is cooking on the stove and I grab my can of Wild Salmon…….. I used the exact same kind as she did on the show and I open it and to my HORROR was a WHOLE salmon!!!!!!!! NO joke, I am like ok I can pick out the meat and discard the bones and all the while I know I can not let Matt see this or he will not eat this. So I pull on my big chef hat (ha) and start pillaging the fish and man these bones are small and even the SPINE was even in there = creepy! So I get as much as I can and realize that now my “wet” ingredient portion is way out of wack with my “dry” and there is NO way I can form a patty of any kind with this goopy mess…. so I kinda have a mini meltdown (Matt would say it was a big one but who listens to him anyways, ha) so we come up with the plan to add bread crumbs, alot of bread crumbs?!?! So I finally form a patty of some kind and fry it up and what it tasted like we are not sure?? Bread crumbs? Mayo? Who knows!! We ate it and I complained the entire time but I wanted to tell you this story because for every great dish I post on here I am sure there was at least 1 I almost ruined!!! It’s all a learning experience! Luckily my mommy is feeding me tonight I need one night to recover from ripping apart fish spine! Yum-o!!! I will have to try that!